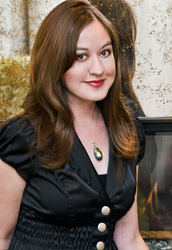 Clarine Harp has had a prolific career planning and producing on-disc content for Funimation Entertainment for hundreds of titles. If you have a disc in-hand, odds are likely she worked on it. Her team handled a wide variety of tasks, such as translations and subtitles, DVD and Blu-ray authoring, video and audio compression, editing, and engineering, quality control, content-planning, and much more. In addition, she has performed many voice acting roles and is best-known for Hetalia (China, Taiwan), Burst Angel (Sei), Samurai 7 (Sanae), Speed Grapher (Ginza), Sekirei (Haihane), Negima (Kaede), Shin chan (Miss Katz), Witchblade (Asagi), Trinity Blood (Mary), RIN ~Daughters of Mnemosyne~ (Laura), and One Piece (Miss Monday, Usopp's Mother, and Ran), and Danganronpa 3: The End of Hope's Peak High School Despair Arc (Peko). Clarine can also be heard in Cat Planet Cuties, Chaos;Child, Chrome Shelled Regios, Corpse Princess/Shikabane Hime, The Sacred Blacksmith, El Cazador de la Bruja, Claymore, Jyu-Oh-Sei, Beck, Yu Yu Hakusho, Fullmetal Alchemist, Case Closed, Evangelion 1.0, D.Gray-man, Bamboo Blade, Aquarion, LASTEXILE - Fam, the Silver Wing-, Tower of Druaga, Ouran High School Host Club, Heaven's Lost Property, Jormugand, Unbreakable Machine-Doll, Yuri!!! On ICE, B'tX, and others. In her personal life, she is an avid knitter and general craft enthusiast. Unfortunately, her yarn habit is not compatible with the presence of her two cats and this regularly causes friction within the household. Fun fact: Clarine is also the inspiration behind the character of Aubrey in the popular webcomic, Something Positive.